The Gram-positive pathogenClostridium perfringens is a major cause of human and veterinary enteric disease largely because this bacterium can produce several toxins when present inside the gastrointestinal tract. The enteric toxins of C. perfringens share two common features: (1) they are all single polypeptides of modest (~25—35 kDa) size, although lacking in sequence homology, and (2) they generally act by forming pores or channels in plasma membranes of host cells. These enteric toxins include C. perfringens enterotoxin (CPE), which is responsible for the symptoms of a common human food poisoning and acts by forming pores after interacting with intestinal tight junction proteins. Two other C. perfringens enteric toxins, ɛ-toxin (a bioterrorism select agent) and β-toxin, cause veterinary enterotoxemias when absorbed from the intestines; β- and ɛ-toxins then apparently act by forming oligomeric pores in intestinal or extra-intestinal target tissues. 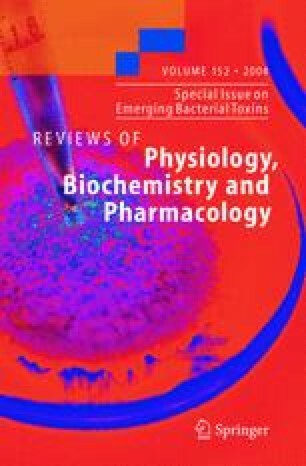 The action of a newly discovered C. perfringens enteric toxin, β2 toxin, has not yet been defined but precedent suggests it might also be a pore-former. Experience with other clostridial toxins certainly warrants continued research on these C. perfringens enteric toxins to develop their potential as therapeutic agents and tools for cellular biology.